• Pace: pace will vary depending on individual ride. Pay close attention to the recommended experience level for a given ride. • Recommended Reading: >>> THE PACE By Nick Ienatsch. • Gear: Head to toe, please. - Proper gear, a working machine and gas in the tank is highly recommended. - Ensure you and your motorcycle are in good working conditions. - Ride within your comfort zone and leave room for bad karma. - Ride staggered in straights. In twisties single file and 2-3+ seconds apart. - Lead may pass slower traffic when it's safe. You don't have to. Remember, someone will wait for you at turns, so just relax and have fun. 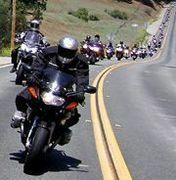 - Leads will maintain The Pace according to road conditions with safety of all riders in mind. Be mindful of others in the group. Let faster riders get ahead of you by moving to the right and signaling them to pass you. And if you want to pass the rider(s) who are in front of you, make sure to do so safely and without startling them. - Do not make unsafe passes, or pass from the right. - When we stop at gas stations, fill up. That may be the only gas stop of the ride. - If you need to leave early, be sure to tell the lead and sweep. Be in the back of the group when leaving so no one follows. - It's a good idea to have road side emergency and towing service membership (e.g., AAA). - Must have CURRENT auto/moto liability insurance. Be sure to carry your proof of insurance card with you in case you get pulled over or get into an accident. - Getting a flat tire in not uncommon. Carry "Stop & Go" tire repair kit. GroupRides gets a group discount. See this link for more info. - Carry water and snacks. Hold a pre-ride discussion. Explain to riders how many groups there will be, leads/sweeps for each group, the pace (spirited, mellow, etc) and when/where you will regroup. Some riders will fall behind. Keep a slow and steady pace in the straights so they can catch up. When stopping to regroup choose a safe spot. Ask the sweep if he/she has observed anything worth noting. Ask riders how they feel about the pace, the ride, and the other riders. Discuss issues with all involved. Safety first is first. Fun is second. 1- If you are new to group riding, start in the slowest group at the back of the pack just ahead of the sweep-rider. Work forward according to your comfort level. 2- Ride at less than 70% of your ability and don’t try to keep up with others. The sweep-rider has graciously volunteered to be slower than the slowest rider and will always follow you patiently. Always report to the sweeper when joining or leaving the group because they are responsible for accounting for all riders. 3- In traffic situations, two bikes make one vehicle in a staggered formation (lead on the front left, trail on the rear right). The trailing rider should yield to the lead and maintain a following distance that allows for evasive maneuvers. When negotiating turns in the road, all bikes should be single file and following distance should be increased by several seconds. 4- The trailing rider should never pass the lead rider on the right side. Side-by-side formation should only be used when stopped. On a right lane-change, the trailing rider should change lanes first and then allow the lead rider to move over into formation. 5- All passing should be done as if driving an automobile; on the left, one at a time, and in a separate lane. Passing a rider in the same lane should only be performed after first being acknowledged (waved by) by the rider being passed. In turn, keep an eye out for faster riders behind you and wave them past you when appropriate. 6- Make sure rider behind you see you when making a turn. If not, wait for them to arrive before proceeding. 7- Sweeps, make sure the lead sees you at re-group spots in order to minimize unnecessary wait. 8- Do not fixate on the rider in front of you, nor on obstacles in the road. Instead, focus on the road ahead and on a safe path around the obstacle. The rider ahead of you may have just made a bad judgment and following their path may be catastrophic. 9- Use blinkers and hand signals whenever possible. Familiarize yourself with commonly used signals. 10- As a courtesy to the group, conduct a pre-ride Safety Inspection on your bike and study the route/carry a map. Take care of fluid needs at appropriate stops (bathroom, drinks, fuel). Program I.C.E. into your cell phone (in case of emergency contact number) and invest in a roadside assistance coverage (AutoClub or similar) in case your vehicle breaks down.